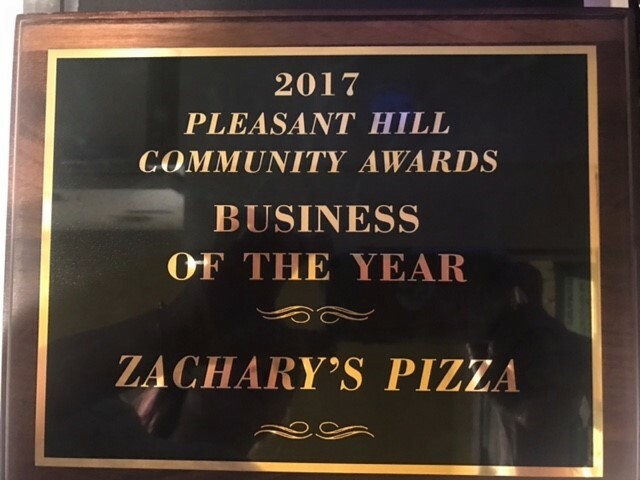 We are thrilled and honored to be 2017’s Business of the Year in Pleasant Hill!!! The City of Pleasant Hill sponsored it’s Community Awards Night on March 27th. 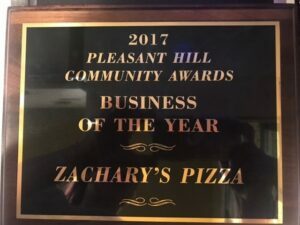 Awards were given out in the categories of Citizens of the Year, Educator of the Year, Teen of the Year, Green Business, and a few other community-oriented categories. Zachary’s President and CFO Kevin Suto, was on hand to accept the award on behalf of our employee owners. In February of this year, we celebrated our 5th anniversary in Pleasant Hill. The Pleasant Hill community has opened their arms to us and we feel like we could not have chosen a better spot. We are incredibly grateful for all of the love we have received from the Pleasant Hill community in the last five years. We can’t wait for five (+++) more! « NEW SPECIAL: CHORIZO CON PAPAS AND ZA-CURRY’S CHICKEN!